Heads Up! My posts may contain affiliate links! If you buy something through one of those links, you wont pay a penny more, but we will receive a small commission, which helps to keep things running! Now that Spring is here thoughts of Summer are brewing: Beaches, Bathing Suits and Sleeveless Tops. Whether you are male or female, we all inately want to look and feel our best. Now is the time to get ready for Summer and start a smoothie making routine. However, you need to beware of what you put in your smoothie. Don’t trick yourself into believing that all smoothies are created equal. For example, if you go to one of those local smoothie shops you will be blown away by the sugar and calorie content. You could be looking anywhere from 400 – 800+ calories. So if you are calorie counting, make sure you order a smoothie that is right for you. Making sure you keep your fridge stocked with all the fresh veggies and fruits and coming up with new recipes can be a challenge. However, I have come across GreenBlender . 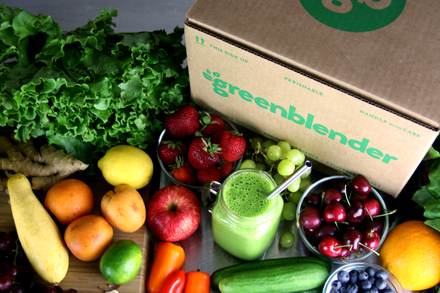 GreenBlender provides farm-fresh ingredients for superfood smoothies delivered weekly to your door. Its very simple: Choose your recipes, get your box, blend and enjoy! Each box comes with easy-to-follow recipes with clear nutritional info and health benefits. I particularly enjoy having hard to find chia, hempseed, matcha, reishi and pea protein to make a superfood smoothie. It’s a win-win for households who are pressed for time. One recommended investment I made was purchasing a Vitamix. I used to have a highly popular model of blender then bought a Vitamix; the Vitamix made all the difference in the world. The presets help tremendously and interestingly enough the consistency of the blend was smoother. I am not crazy it is true. So now, with my Vitamix and the GreenBlender program on the horizon, I am prepared to embark on the life changing journey of smoothie making. Vitamix Professional Series 750 Blender, Programmable, Self-Cleaning 64 oz. Container, Heritage is the model I use regularly. Deliciousness delivered to your door by GreenBlender. Now there are no excuses not to make a smoothie or a healthy juice. Its a fantastic plan to jumstart your summer bod! This entry was posted in Cook’s Tools, food, Kitchens, Recipes, Shopping and tagged appliances, food, products, recipe, smoothies. Bookmark the permalink.